Within the framework of the Carpet Oasis exhibition in Dubai, the Harfti Tharouti training course was launched, benefiting 27 women, among them women and adults. The move is a joint initiative of Dubai Customs, which organizes the "Carpet Oasis" at City Walk II and the Community Development Authority in the Financial Empowerment of Women, which aims to provide the beneficiaries with skills in the carpet industry, enabling them to start small businesses and enter the market. the work. Suhaila Al Khazali, one of the first Emirati women who has penetrated the carpet industry in the UAE, has been trained in the field. She has achieved excellence in this field for her constant quest to transfer knowledge and train more Emirati women in the secrets of this craft. The trainees will complete 45 accredited training hours at the exhibition premises to learn knitting skills using the UAE and the UAE. Technical designs for attractive tourist sites in the country have been selected to be used as work models for each trainee. "The objectives of the Harvey Tharouti initiative are in line with the overall vision of enabling and integrating segments of citizens," said Youssef Bin Lahej Al Falasi, director of the Community Empowerment Department at the Community Development Authority. "They allow them to think about small projects from their homes or through workshops And thus entering the labor market in a field that enables them to achieve financial independence and build a better future for themselves and their families. " Farida Fadhel, Chairman of the Carpet Oasis Committee, said that through the Carpet Oasis, Dubai Customs seeks to delight all interested parties and create new partnership opportunities, not only by providing an economic platform for carpet manufacturers and traders, but also by enhancing its role. Social empowerment of community members. 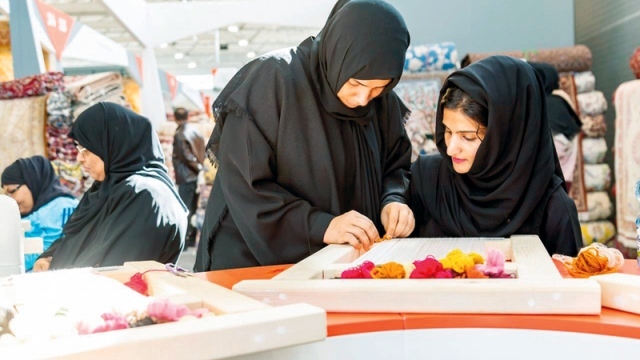 "The main objective of this initiative is to empower Emirati women and activate their productive role in society," said Mariam Al Shamsi, vice president of Dubai Carpet Carpet Oasis. • "The initiative prepares participants for a craft, encourages them to think about small projects from their homes, or through joint workshops and entry into the labor market." Cash with King's Day? "Take a look at the free market"
Het Bonnetje: "I started living together, and can finally save"
Sri Lankan attacks .. Does it lead to the rise of the tone of "Islamophobia"?